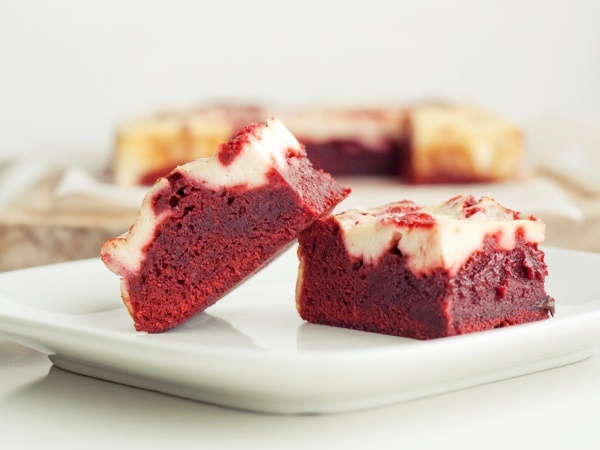 These brownies topped with a cheesecake swirl are the perfect recipe for red velvet beginners - they are easy to make and mouthwateringly delicious! Preheat the oven to 180 °C. Grease and line a 15 x 24 cm baking tray or ovenproof dish. Allow the paper to come up the sides of the dish and hang over a bit. This will help with turning out the brownies later. Whisk the butter, oil, sugar, vanilla essence, food colourant, vinegar and eggs together. Sift the flour, cocoa and salt together and mix into the wet batter. Add the walnuts and fold through. Pour the batter into the prepared pan, reserving about 2 tbsp. for the top. For the cream cheese layer, whisk together the cream cheese, sugar, egg and vanilla essence. Very gently, as the red velvet batter is very runny, dollop spoonfuls of the cream cheese onto the batter. Spoon the remaining red velvet batter on top of the cream cheese. Use the tip of a knife to create swirl patterns through the cream cheese. Bake for 30-35 min. Check with a wooden skewer if the brownies are baked through. If not, cover with foil to prevent the cream cheese layer from browning and return to the oven for a further 5-10 min. Allow to cool completely before cutting into blocks.